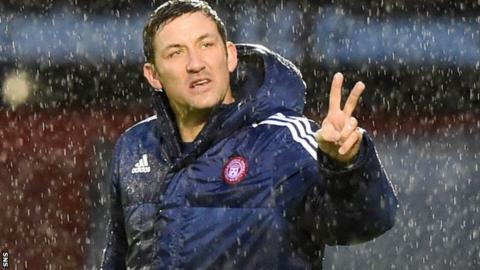 Martin Canning believes that his January transfer dealings could be the deciding factor on where Hamilton Academical finish the season. Accies sit ninth in the table after a run of three straight defeats and one win in their last 10 games. "January could be important if you can bring in the right one or two players," the player-manager said ahead of Inverness Caledonian Thistle's visit. "It could definitely make a difference and it's something we are looking at." However, the 34-year-old who signed as a defender at New Douglas Park in 2008 thinks Accies have more strength in depth now than he has experienced. "We have been keeping an eye out for a wee while to see if we can strengthen and we're continuing to look," said Canning. "The squad is strong right now - certainly the strongest in my time here - so we don't need to add volume, just one or two guys who can bring extra quality. "They won't be easy to find as the quality here already is high." Hamilton lost 1-0 at home to second-bottom Kilmarnock on Saturday, but Canning is confident his side will soon get the rewards he believes their efforts deserve. "If you look at the league, it's not just us in this situation," he said. "I think Inverness are two wins in 10, Dundee are going through a similar spell. "Kilmarnock, Dundee United and Partick have all gone through these kind of slumps. "It's just a strange league this year. You can go through these spells not picking up points, but everybody stays bunched together. "If you can pick up three or four wins then you can climb the table quickly." Accies are only two points ahead of Kilmarnock in the relegation play-off spot. "But we're not worrying about relegation," insisted Canning. "Okay, we're only two points above Kilmarnock, but we're still only one below the top-six. It's not like we're cut adrift. "I've said from day one or main aim is to stay in the league. "We knew it would not be plain sailing all the way. There are times we need to dig in and this is one of them."